This summer, get your kids off of their iPads and video games and send them outside to play! Find creative ways to keep your family moving with physical activities that are focused on fun. Discover something new – Just because kids have a break from school does not mean that they should stop learning. Use the spare time for kids to try a new sport or hobby such as learning how to shoot a basketball or trying out a pair of roller blades. Everything is cooler with water – Whether it be a slip and slide or a water balloon fight, nothing can keep kids more entertained and cool while they are running and jumping on the hottest of summer days. Neighbor night – If you live in an area with other families who have children, plan an evening get-together for the kids to play neighborhood games such as Capture the Flag or Freeze Tag. Parents who are looking for group activities to keep their children active and social while keeping a routine should look for camps that accommodate their needs. The Wilfred R. Cameron Wellness Center of Washington, PA offers a Fit Kids Camp for children who are entering 1st grade through 12 years old. The program is designed to enhance the physical, social, and emotional wellness for youth through structured activities. Experienced counselors lead campers in fitness drills, sports, arts and crafts, rock climbing, swimming, and nutrition lessons. Campers also have the option to participate in dance and martial arts classes. 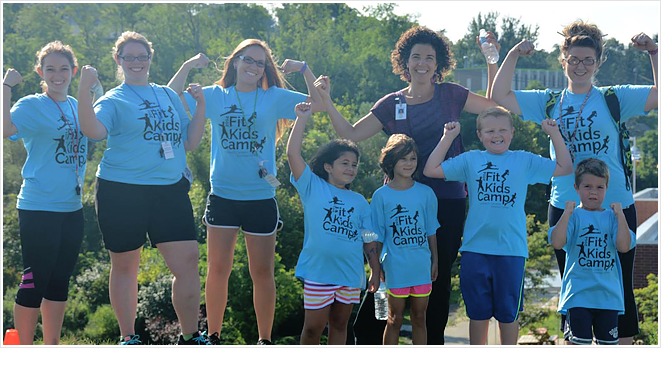 Fit Kids Jr. gives the younger children, ages 4-6, a chance to experience camp two days per week. Games are based for preschool and kindergarteners to improve their gross motor skills while learning to interact with other children. "I have seen children who were used to a sedentary lifestyle transform into healthy, self-confident, powerful individuals. The kids take what they learn home to share with their families, thus creating happy and healthy homes," says Emily Mahoney, Fit Kids Camp Director. A summer at Fit Kids Camp is a fantastic way for children to learn healthy habits that they will carry with them through the rest of the year. Kristy Boyle, ACSM, is a Health Fitness Specialist and Fit Kids Jr Supervisor at the Wilfred R. Cameron Wellness Center of Washington, PA. If you would like to register your child to attend the Fit Kids Camp this summer or if you would like to learn more about other programs at the Cameron Wellness Center visit www.wrcameronwellness.org.